The Indian public healthcare system strenuously lacks healthcare facilities especially in rural areas where the ratio of population and infrastructure is skewed. Internet and mobile apps bring healthcare in the hands of the consumers but a personal and human touch is missing. Among urban population, although healthcare awareness is increasing, the clinical encounters mostly remain reactive. The patient comes to the clinic or hospital only in case of an illness or event. There lies a tremendous scope and opportunity to bring equity in healthcare delivery to the rural and urban consumers. This can be achieved through disruptive ideas in healthcare services by healthcare providers and insurers across India. This equity can be accomplished through a proactive approach towards wellness by deploying retail health-kiosks near rural and urban marketplaces. Such easy access to healthcare facility will also reduce burden on clinicians and hospital personnel. Retail in healthcare means creating opportunities of clinical encounter in a marketplace other than hospital and clinic. Retail healthcare should primarily focus on vaccination, patient education, information sharing, specimen collection and reports, vital sign check, wound dressing and aftercare, injections, tele-consultations, patient registration and appointments, referrals, and acceptance of payments. In urban areas, these clinical encounters in the form of retail health-kiosks can be created in or around malls, coffee shops, libraries, airports, cinemas, theatres, crowded junctions, large corporate offices, housing societies, clubs, and other public gathering places. In rural areas, such encounters should be customised by mobile health-kiosk vans at community centres, bus stands, railway stations, places of worship, school, grocery and vegetable markets. Personnel in health-kiosks will then be able to educate and disseminate information on personal hygiene, reproductive health, maternal and infant health progress, nutrition, and educational information in the form of live display, standees and pamphlets. These encounters will also be useful for vital signs measurements (weight, pulse rate, temperature, respiration rate, blood pressure, partial pressure of oxygen, etc), screening tests (diabetes, malaria, dengue, chikungunya, etc), blood and specimen collection, and report delivery of diagnostic tests, and access to electronic health records. 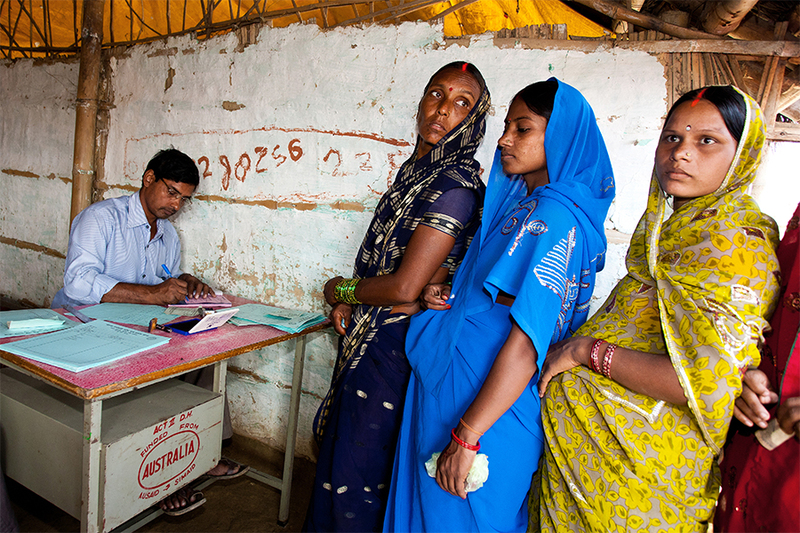 At the health-kiosks, most of the services should ideally be provided free. The charges for sample collections and containers could be included in the cost of diagnostic tests. The fee for wound care, injections, drug administrations, and point-of-care diagnostics tests could be priced as nominal near actual cost or even be subsidized by healthcare providers and insurance companies and other stakeholders. These health-kiosks could be operated by a registered nurse personnel. This will also be a good utilization of surplus nursing manpower in India while reducing burden from doctors who are comparatively limited resources. To bridge a healthy trust with the patients, periodical visits by general physicians and specialists could add value in this initiative. 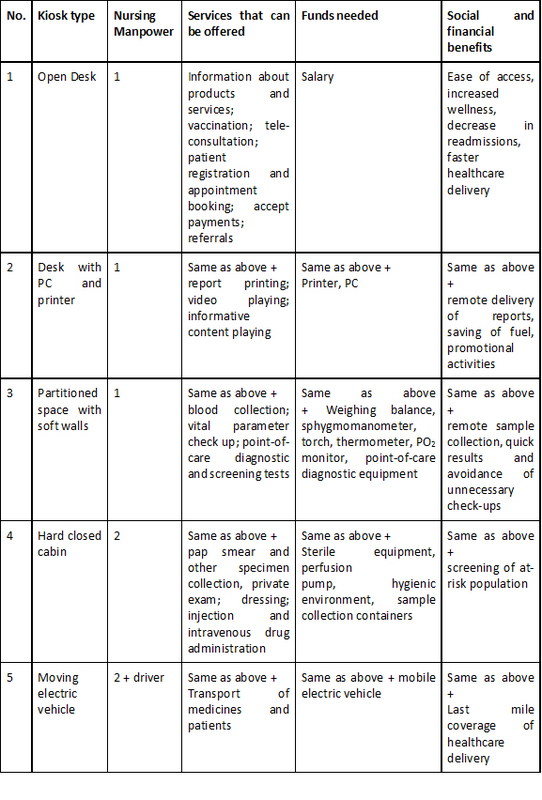 The health-kiosks may be of various forms depending on specific needs and availability of resources as shown in the table below. • Hygiene needs to be maintained by following biomedical waste disposal as per local and regulatory requirements. • The manpower deployed at the health-kiosks will need to be trained to provide good customer experience. The personnel will need to be fluent in local languages. Challenges can be overcome through planning. For such models of delivery to be successful, we need joint effort among the various stakeholders. Health-kiosks have the ability to maintain the personal touch which cannot be provided by Artificial Intelligence or Mobile Apps or chat bots. The health-kiosks will truly shift the focus from sick-care to health-care in its truest sense.